Let’s assume you are accounting quite happily for your single company, transacting in your single ‘home’ currency only. Let’s assume you’re in the US, so everything is dollars. Of course you may buy the occasional item or service priced in a foreign currency, but you buy on your credit card so the transaction is still in USD. Same with travel expenses. Simple! So those foreign currency sales invoices need to be entered into your accounting/ERP application. Let’s use invoices in Euros (EUR) as our example. 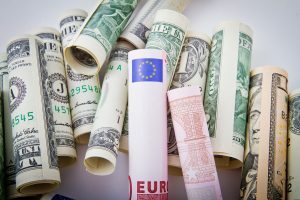 The easiest first step is to enter them as USD in your system, by converting manually from EUR to USD using the exchange rate for the day, or the month. You may be forced to do this if your system does not support multi-currency accounting, or maybe you don’t have the time or knowledge to set it up for multi-currency. What happens when the customer pays in EUR? How to handle open EUR invoices at the end of an accounting period? Let’s assume the customer pays the invoice after 60 days. They pay in EUR but into your USD bank account. Clearly, the amount you receive in your bank account will be different to the USD amount you recorded for the invoice in your system. But the customer paid the full EUR amount, so the invoice is fully paid. How do you account for the difference? The first of these would normally be coded to a ‘realized’ currency gain/loss account. The last should go to bank charges. The middle could be interpreted as either. But you’ll need to calculate these manually and record them in your accounting system. If there are significant amounts invoiced in EUR at the end of an accounting period, you may need to revalue them. * Currency volatility is no longer restricted to minor currencies, witness GBP rates after the Brexit vote. Again, you’ll need to do this manually if you enter your invoices in USD. You may have many more types of transactions in foreign currency, and you might have foreign currency bank accounts. Of course, a much better solution is for your accounting system to automatically handle foreign currency transactions, and most of the larger ones can do this well. How this is typically done, and how to set them up, I’ll leave for a future post. Meanwhile, we’d be happy to help (for free!) if you have any questions or comments.